One of my favourite aspects of Tudor’s Heritage watches are the small references to the details that are so important to collectors, especially those of their vintage watches. The Black Bay was equipped with a domed sapphire crystal, so beloved of vintage Submariner fans. The Heritage Ranger had ‘drilled lugs’, a small but important detail of vintage Oyster watches (as were the straight endlinks on the reissued Ranger’s steel bracelet). 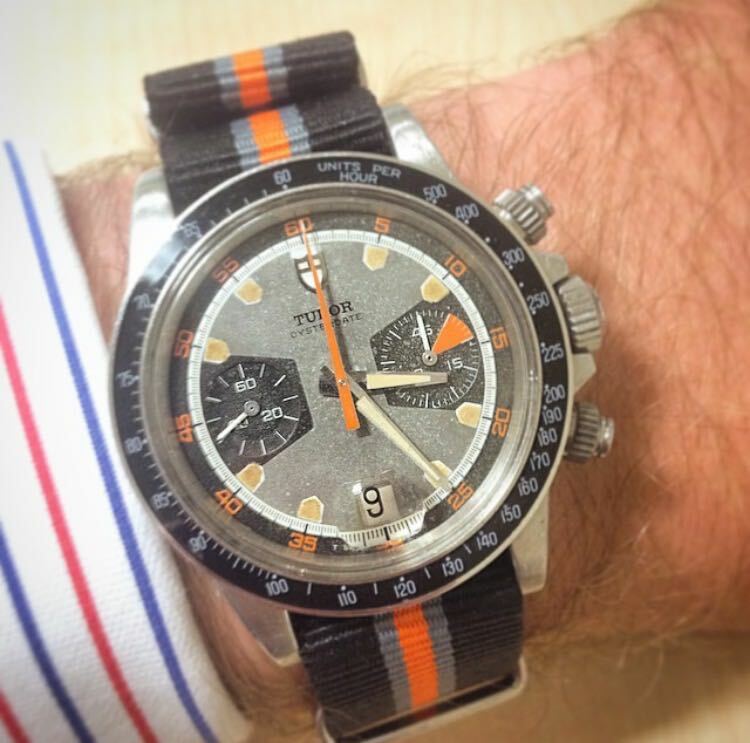 A key focus of vintage watch collecting is also the choice of strap. For many years now there has been an almost cult-like following for the G10 NATO straps – originally used by the armed forces on military issued watches (most famously in this context, the Tudor Submariners of the French Navy, the Marine Nationale). Originally issued only in grey, they are now available in a kaleidoscope of colours to suit every occasion and outfit. Tudor recognised this modern trend and all of the Heritage watches are supplied with an additional NATO-inspired fabric strap to give owners the option to change the look of the watch with relative ease. The first watch in the line is still, for me, one of my favourites – the Heritage Chronograph ref 70330, based on the iconic ‘Homeplate’ chrono. To many Tudor collectors , the ‘Homeplate’ is one of the holy grail watches to acquire. Released for a short run in 1970, the watches feature one of the most instantly recognisable dials ever produced, in a striking colour combination of grey, black and orange with the namesake hour markers that were shaped like the home plate on a baseball field. The original watch was conceived in three variations, two of which made it to full production. 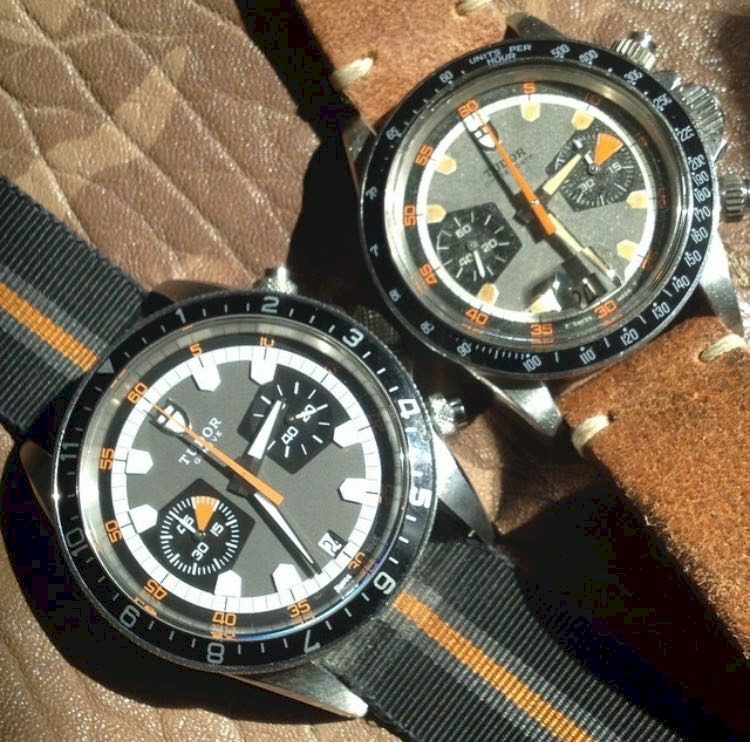 References 7031 and 7032 were essentially the same watch, the differentiating factor being the black bakelite tachymeter bezel on the 7031 and all steel tachymeter bezel on the 7032. The third version, that never made it beyond prototype, had a 12-hour bidirectional turning bezel and was given the reference 7033. It was this never before available incarnation that Tudor chose as the inspiration for their Heritage watch. 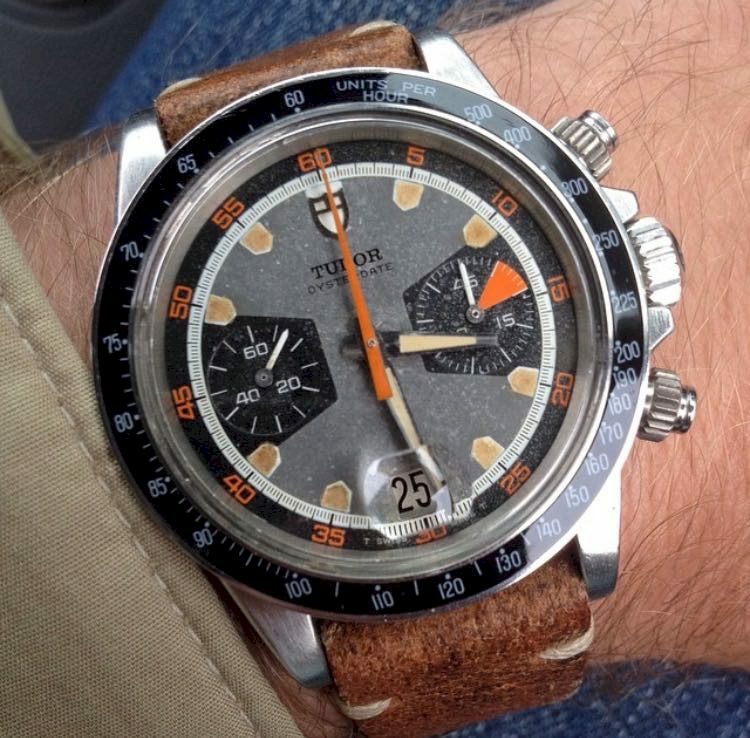 If the Heritage Homeplate watch is my favourite of the current Tudor collection, then certainly I would say that my favourite vintage chronograph without doubt is the Homeplate reference 7031. It is, of course, a matter of personal taste but to me the black bakelite bezel perfectly frames the iconic dial and picks out the black aspects, especially the outer minute ring. The watch has always had a link with the world of motor racing and is known also as the Porsche Chrono, due to the fact that an advert for the Japanese market featured the watch with a Porsche 911 (the relationship with Porsche and motor racing generally is still enjoyed today by Tudor). 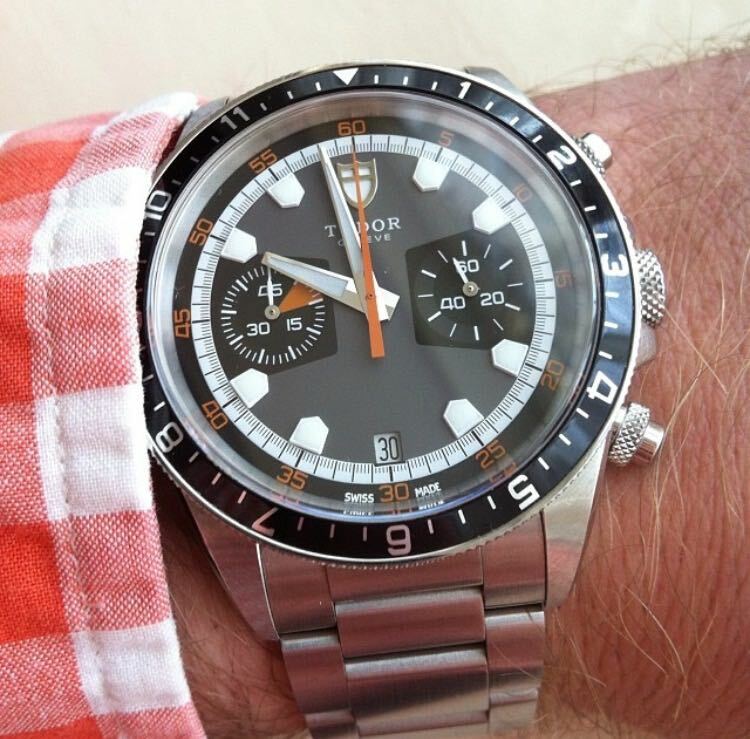 The watch was a bold move for Tudor, in both its size and styling but it proved to be the beginning of a very successful run of colourful dialled chronograph watches. The watch benefitted from the Oyster case, with its screw down winding crown and case back. The 7031/2 was also equipped with screw down pushers that meant the watch was waterproof; a huge benefit for a sports watch. 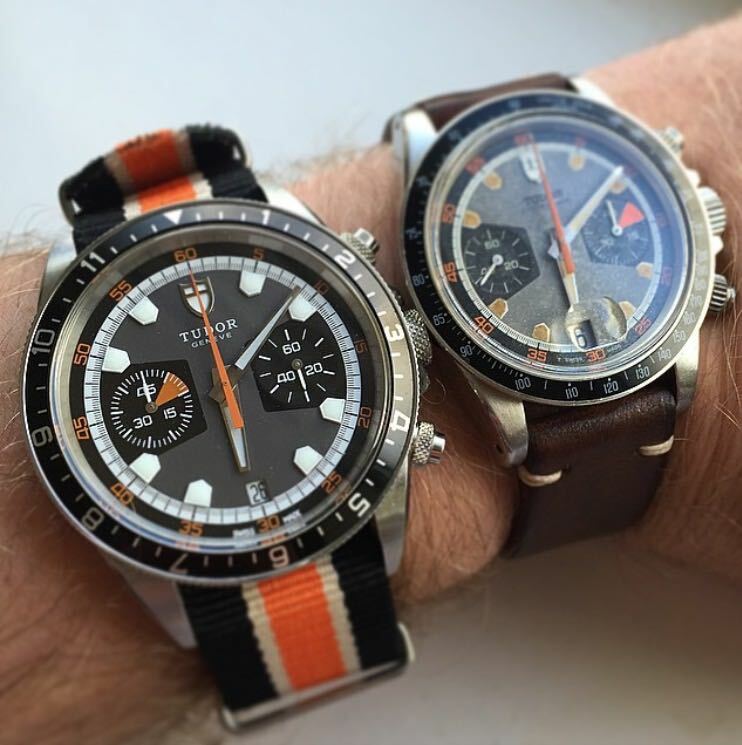 The 7031 and 7032 with the grey dials are rare watches, especially one in all original condition. As a matter of routine, during service Rolex would replace the winding crown and chronograph pushers to ensure the integrity of the case’s waterproofness was maintained. Whilst this made sense at the time (they were tool watches after all and needed to be at optimum performance), collectors prefer examples with the parts that the watch was originally supplied with. There is, however, an exceptionally rare version of the watch with a black dial. There are reputedly less than a dozen examples known to exist and it is (with exception of some of the military Submariners) arguably the rarest Tudor watch in existence. There are theories that it was only available as a service item, to address the fact that some of the early grey dials suffered from a mild corrosion issue like that seen on the early black snowflake Submariner dials. The fact that they chose to release both dial colour ways, was another acknowledgement of how important to Tudor the heritage of the brand is. The spirit of the vintage watches is clearly there in the Heritage Chrono. The case has been ‘beefed up’ for modern tastes and measures 42mm, with a slightly increased lug width of 22mm. The easily scratched plexi crystal of old has been upgraded to a sapphire glass, without the magnifying bubble over the date – known as the cyclops to collectors. The watch collecting community seems to be divided over the cyclops; some love it and others loathe it! It is quite a common modification to have the cyclops removed on sapphire glass watches or to replace the cyclops glass for a domed ‘tropic’ glass on vintage watches, especially Submariners. For me, on this watch, the absence of the cyclops bubble gives the whole piece a clean line that works well, especially on the grey dial. Where on the vintage watches the hour markers were painted, on the heritage Chrono the hour markers are applied which gives the dial more depth. The biggest difference is the automatic movement. The original Homeplate was manual wind and, due to its age, had a non-quick set date function. For the modern consumer the updated movement makes the watch a much more practical option. Both watches are important in their own right and Tudor’s re-edition is certainly one of the biggest hits of recent years in the vast world of Horology. They are very different beasts, but they share a DNA that is both charming and exciting in equal measure and with it Tudor have won the double – two Homeplates…each a Home Run!